Floating Away Your Anxiety And Stress : Shots - Health News Americans' stress levels rose significantly over the past year, according to the American Psychological Association. 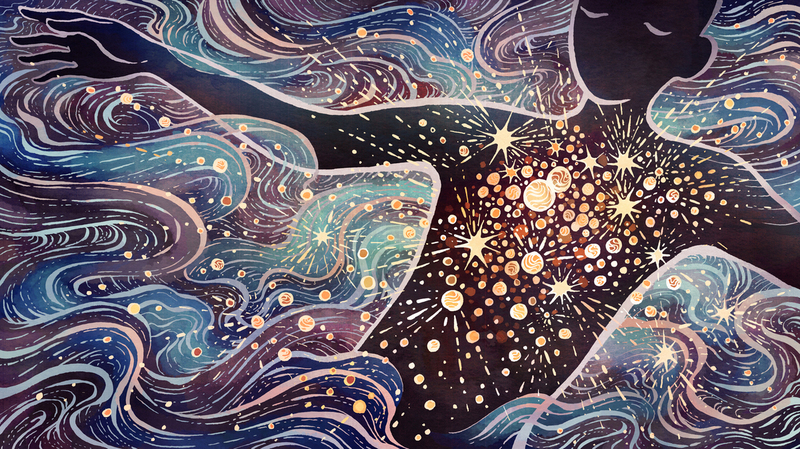 A doctor tries float therapy to see if it can help him feel less stressed out. Yes — spend an hour in a dark, soundproof room floating in a body-temperature warm pool. "The heavy salt concentration does the work for you," my friend told me. "You just lie there and meditate." As a doctor wary of overprescribing medications, I was intrigued by the idea that floating can combat stress and anxiety, but I wanted to know if there's any science to back up this claim. So I visited the lab of neuropsychologist Justin Feinstein at the Laureate Institute for Brain Research in Tulsa, Okla. Feinstein is investigating float therapy as a nonpharmacological treatment for people with conditions like anxiety and depression. "These are individuals with PTSD disorder, panic disorder, generalized anxiety disorder, social anxiety — we covered the whole spectrum of different types of anxiety," he says. Before volunteers get in the pool, Feinstein maps their brains using functional MRI, which provides images of the brain's metabolic activity. Feinstein takes images again after a 60-minute float. And he's finding that floating seems to quiet activity in the amygdala, the brain's center of fear and anxiety. Feinstein asked if I wanted to try it, so after a quick shower, I jumped right in. 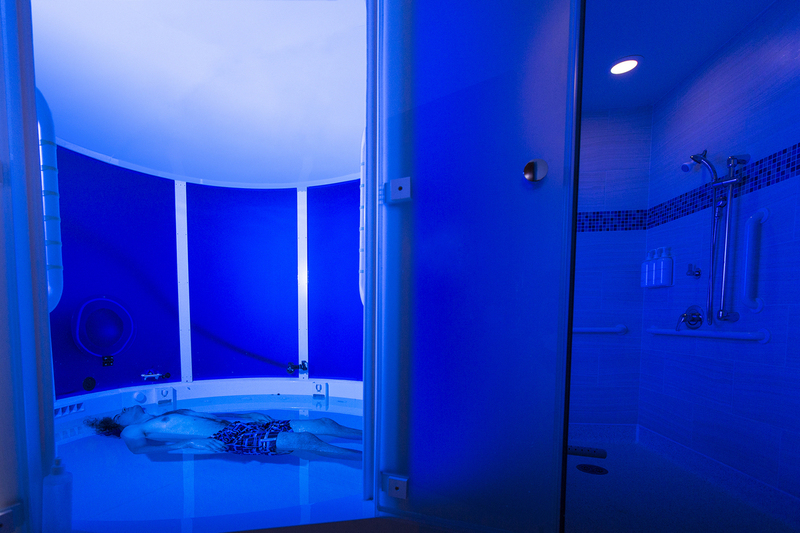 A staff member demonstrates the float tank used for studies at the Laureate Institute for Brain Research in Tulsa, Okla. The round pool is 1 foot deep, 8 feet in diameter, and saturated with 1,332 pounds of magnesium sulfate, commonly known as Epsom salt. It holds you up like a mattress. The room is soundproof, the lights are off and you just lay back and float. Floating made me feel weightless; it's kind of like being suspended in air. I could feel my muscles relaxing. There was one exception — I noticed how clenched my jaw was, probably my natural state of being. I really had to focus on letting it relax. It took a while to let my thoughts quiet down, but eventually I was so relaxed I fell asleep—while floating! While this sounds promising, it's important to remember that this research is preliminary. One of Feinstein's pilot studies, which is currently under review for publication, found that in 50 individuals with anxiety, all showed measurable signs of relaxation including lowered blood pressure, lowered activity in the brain, and significantly reduced symptoms of anxiety. Feinstein has found that some of these effects can last over 24 hours. The Float Clinic and Research Center has many other ongoing studies and another currently under review for publication. Even though floating isn't a proven treatment, more and more commercial float centers are opening across the country, including the H2Oasis Float Center and Tea House, which opened here in Tulsa a little over a year ago. It uses the same open pools that were designed for Feinstein's lab as well as small, enclosed float pods which can be claustrophobic for some people. A one-hour float session costs between $50 and $70. "At the very minimum, you are going to have one of the most relaxing hours of your life," says Debra Worthington, co-owner of the facility. She says that many people come here trying to float their anxieties away — injured athletes, veterans with PTSD, people with chronic pain and anxiety. "I have people leaving the pools crying because they never knew they could feel that good because they have so much pain on a daily basis, whether it's physical pain or mental pain," Worthington says. While medication is beneficial for many anxiety and mood disorders, many classes of the drugs are habit-forming, and all have side effects that patients often find unpleasant. So while floating isn't a proven therapy, there's little harm in trying to float some of that stress away.